The sad news that song writer and guitarist Billy Strange died at age 81 Wednesday was picked up by the Swedish media as well. A telegram written by the news agency TT Spektra with the headline "Presley's song writer Billy Strange dead" has been published by all the major newspapers (here's one example). The telegram mentions that Billy Strange wrote several songs for Elvis Presley with Mac Davis. Also, that the best known is "A Little Less Conversation," a song that only had minor success when released in 1968, but went on to become a worldwide hit in 2001 when it was remixed by Junkie XL. In Ken Sharp's book Writing for The King Billy Strange tells the story of how he got to know about the remixed version of "A Little Less Conversation." We got a call from the London Times and they sent a lady and a photographer and did four hours of interviews with me. She's the one that made me aware of the Nike commercial with the remix. Everything else that's happened since then has just been total amazement. [...] The success of "A Little Less Conversation" certainly validated the song for me. The treatment of the song was new enough that younger people got into it and they didn't when it first came out as a single in the late Sixties. How right he was about that. I have no trouble recalling how excited I felt listening to the remix for the first time together with a couple of colleagues, and hearing them exclaim how great it sounded. The song was played on the radio day after day and quickly raced upp to the number 1 spot in Sweden (as it did in many other countries). 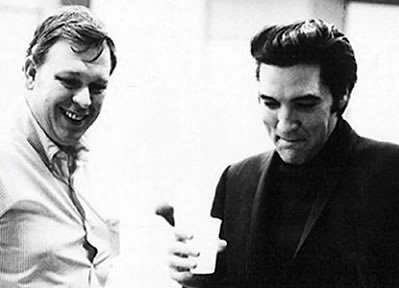 In his book A Life In Music, Ernst Jorgensen has this to say about Billy Strange while on the subject of the soundtrack recordings for The Trouble With Girls: "Having produced almost nothing successful or artistically significant, Billy Strange's relationship with Elvis Presley ended with these recordings." Indeed, the book was written before the remix of "A Little Less Conversation" saw the light of day, but I still think the statement seems a bit unfair. Not only did Billy Strange co-write "A Little Less Conversation," he also produced the soundtrack session for Live A Little, Love A Little where it was recorded together with three other songs, among them the psychedelic "Edge Of Reality" and the beautiful ballad "Almost In Love." And let's not forget "Clean Up Your Own Backyard," another song he wrote with Mac Davis and produced for The Trouble With Girls. Actually, all the songs I've mentioned can be found on the Almost In Love album release from 1970.On it you'll also find "Charro," another Billy Strange-Mac Davis number. The last two songs they wrote togheter, "Memories" and "Nothingville," appear on the Elvis NBC-TV Special album. So I think it's safe to say that Billy Strange's relationsship with Elvis was a successfull one. And artistically significant.